The death has occurred early this afternoon of Tomás Mac Giolla, former President of the Workers Party, TD for Dublin West (1982-1992) and Lord Mayor of Dublin (1993/94). He was 86 and is survived by his wife May (née McLoughlin) and his sister Evelyn and his nephews and nieces. Mr. MacGiolla passed away in Beaumont Hospital, Dublin early this afternoon. He had been ill for some time and had been in hospital for the last week. Tomás Mac Giolla was born in to a farming family at Nenagh, Co. Tipperary on January 25th, 1924. He was a nephew of the Irish Parliamentary Party MP, T.P. Gill. He was educated at St. Flannan’s College, Ennis, Co. Clare and in University College Dublin where he completed a degree in Commerce. He subsequently worked as an accountant with the ESB from 1947 until he became a full time public representative for the Workers Party in the late 1970s. Mr. Mac Giolla joined Sinn Féin around 1950 and stood unsuccessfully for his first election for Sinn Féin in North Tipperary in the 1961 general election. He was elected President of Sinn Féin in 1962 which was the same year in which the late Cathal Goulding became Chief of Staff of the IRA. Together they played a pivotal role in transforming the republican movement away from nationalist armed struggle towards socialism and into what would eventually become the Workers’ Party. He was elected to Dublin City Council in 1979 and was Workers Party TD for Dublin West from 1982 to 1992. In 1993 Tomás Mac Giolla became Lord Mayor of Dublin. He remained active in politics after his retirement and was a member of the Ard Comhairle of the Workers Party until his death. Paying tribute to Mr. Mac Giolla this afternoon, the current Workers Party President Michael Finnegan, who is Mr. Mac Giolla’s former director of elections in Dublin West, said that Tomás Mac Giolla was a greatly underestimated figure in Irish politics who played a major role in the struggle for civil rights and democracy in Northern Ireland and for people’s rights throughout Ireland and internationally. Our objective is the re-conquest of Ireland from the Ground Landlords, the river barons, the speculators, the cartels and the monopolies and the struggle against them will now be intensified. If needs be, we must be prepared to win back our country farm by farm, river by river, mine by mine, shop by shop, and factory by factory. Tomás was a tireless and fearless fighter for the Irish working class, no more so than in Dáil Éireann. It was Mac Giolla’s interventions in the Dáil that initiated the process that brought the corruption of the political elite into the light of day. But parliamentary politics was only ever one small part of his activism, only ever one front in his struggle for socialism. This is not the time for a full account of his career. But to me Tomás Mac Giolla was an inspiration. To hear Mac Giolla take hold of the microphone and talk about the unity of Protestant, Catholic and Dissenter was to hear the authentic voice of republicanism. When he spoke about Iraq or Serbia, you understood clearly what internationalism meant. And when he spoke about the oppression inherent in the capitalist system, you were reminded of Swift’s saevo indignatio or Guerva’s statement that the revolutionary was motivated by the love of mankind. It brought back memories of why you became a socialist in the first place. Vivacious, passionate, human. This is the Tomás Mac Giolla I will remember. A visionary, a socialist, a Republican: a true leader and a giant of the Irish Left. This is what he was. Agreed. Tomás’s legacy is totally underestimated. He was a champion of civil, social and human rights and a fearless opponent of capitalism. May was at his side through it all and deserves many accolades in her own right. Again agreed, one’s sympathies are with his wife May and family. I’m sorry to hear this. Condolences to his family, friends and comrades. Little birdy tells me that there is an interview with Tomas in the Mail this saturday… and he has a right go at his ex-WP colleagues. Very sad to hear of his passing, a man of stature in all senses of the word. Whilst walking home I listened to Radio 1s 6 O’Clock news where there was no mention of Tomás. The Irony being that they covered a story about introducing VAT on Local Authority service charges, charges Tomás MacGiolla fought against himself. In the 1992 General election he lost his seat to Liam Lawlor by 55 votes … the returning officer a Mr George Redmond! I heard his death mentioned on Raidió na Gaeltachta’s news programme at 1pm and later in the afternoon as well. while i disagreed with much of his politics I am saddened to hear this. While a good age and away from the headlines for some time, there is for me, a real sense of the passing of an era. Unlike some of those who swerved to avoid the turmoil that was on the horizon, his politics didnt change to accomodate the new ‘consensus’ and quite rightly too. Genuinely saddened to hear of his passing. Sorry to hear of this. A man I admired and respected. That’s very sad news. I never knew him, and why would I, but he was always known as one of the good guys, somebody who remained a socialist, and a republican by his own lights, until the end when most of the comrades had long gone. I’ve spoken to quite a few people who parted company politically with him decades ago, but who were always very warm about him personally. Ar dheis De go raibh a anam. I was saddened this morning when I heard of the passing of Tomas. I can still remember the first time I saw him, I was 4 yrs old and he was like a giant to me. He will remain in my memory as a giant of a man in all aspects. He was a true champion of the working classes who remained true to his beliefs until the end. My condolences to May and extended family. Ar dheis De go raibh a anam. Just watching TV3’s Taoiseach show. They showed Haughey’s resignation speech to the Dail. All the TDs were applauding him, including FG, Labour and WP: Gilmore, Rabbitte, Sherlock etc…except Tomas Mac Giolla- his arms were folded and he was stony faced. Fair play. Sean Garland was interesting, paying tribute to MacGiolla on Vincent Browne. Browne was no friend to the Officials/Workers Party, but at least he had the sense to have a friend and ally of MacGiolla on rather than people who were his bitter opponents for the last nearly two decades of his life. Unlike some other media outlets. Didn’t share all aspects of his political orientation, but he was a transparently honourable man and one of a handful of honest men in Irish politics. Go easy, comrade. Let’s hope De Rossa has the decency to stay away from the funeral. 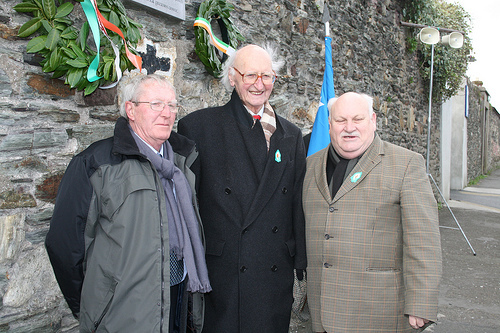 Just for information sake, the photo above shows Tomás at the Easter Commemoration in Waterford in 2007 – also in the photo are former local WP councillor Billy McCarthy (left) and longtime and current Workers Party councillor Davy Walsh. I was really shocked when I heard the news that he had died. A man whose life was devoted to liberty, equality and fraternity – a true republican who lived for the struggle for progress in Ireland. A radical freethinker and, rarest of all in Ireland, an honest politican. Condolences to his family. Didnt agree with a lot of his views but he always struck me as being an honourable man. A sad day indeed. A long and honourable life though. Does anyone know the funeral arrangements? Funeral arrangements still being finalised and will be put online here and on WP website etc as soon as known – looking like it will be Monday. Go raibh maith agat, a Dhrithleóig a chara. Sorry to interrupt the love-in but Tomas MacGiolla was a leading member of a terrorist organisation which both murdered civilians and carried out targeted political assassinations. Moreover, the OIRA remained heavily involved in criminality throughout the 80s and 90s, and if Panorama is to be believed, recently conspired with the world’s most repressive regime to counterfeit 100 hundred dollar bills. and I thus find it rather difficult to mourn his passing. What does it say about this country that former terrorists can be eulogised in this way as if butter wouldn’t have melted in their mouths? When Haughey died, the reaction of most people on this site was probably “good riddance” and rightly so. Yet an old bank-robber like MacGiolla is getting more plaudits than Mother Theresa. Bizarre. Catullo, a number of obvious thoughts suggest themselves. Firstly he was a member of an organisation which, whatever its faults (and I’m no uncritical booster of the WP) did move away from armed struggle in the context of the island. And that left an obvious, difficult and at many times contradictory legacy. Many of the eulogies are precisely because of that move and because many others who would take opposing views recognised a man of principle and integrity whatever the differences. And that’s before we get to his record as an activist, a public representative and so on and a steadfast advocate of progressive politics. Now Haughey is quite radically different in that – from most perspectives – he appears to have arguably got worse as time went on and demonstrably did what he did for his own benefit and aggrandisment. The problem with the Stickies’ move away from violence, like that of the Provos after them, and indeed that of FF before them, is that there was never much repentance involved. It is obviously a good thing that all three did abandon the gun eventually, but their reasons for doing so were not necessarily principled. In each case, they decided that constitutional means would be more effective at achieving their political ends. None of them ever repudiated the use of violence as a legitimate tactic under certain circumstances. The Provos are the only ones who have ever actually decommissioned any weapons (and they were hardly willing about it), though apparently what’s left of the Stickies are now in talks with de Chastelaine. Is that an ethical reaction – denial? I don’t think so. Did he ever apologise to the victims’ families or indeed to the officers whom his organisation was trying to kill? Just not good enough, I’m afraid. He denies he knew about the attack in advance, despite being on the Army Council. Frankly I find that incredible but judge for yourselves. There’s no question that MacGiolla was in many ways a fine public representative in later years, but I don’t think that makes up for his crimes. If he had publicly renounced the Official IRA and apologised for advocating the use of violence, then I would have nothing but respect for him. But he never did and the Stickies remained something less than “slightly constitutional” as a result. No need to start another discussion about the “special activities” here. Suffice it to say that these numerous failings outweigh his achievements in my book. His intransigence ultimately helped destroy one of those achievements — a mass left-wing party — as well. The problem with that analysis is that it is entirely ahistorical. You argue that Mac Giolla was ethically challenged and unprincipled without any sense of the context of his actions. 1968 – 1972 wasn’t some platonic perfection against which his supposed lack of moral virtue can be contrasted, but was in reality a period where an intrinsically repressive state fractured both from internal contradictions and the fact that a minority within that state came into sharp conflict with that state. The credit to Mac Giolla and others is that they sought to avoid a sectarian war and the logic of that ultimately led them to avoiding armed conflict entirely. I’m not, as I noted previously, unaware of the contradictions that the shift this produced in terms of Group B, etc, but those too were legacies of the histories of these past century or longer. The organs of the state itself in 1969 proved entirely incapable of carrying out their duty of care to their own citizens. Subsequently that led to a sterile confrontation between the state, the British one directly eventually once Stormont was prorogued, between opposing camps. Personally I think that violence (other than that which was defensive) by the mid 1970s was largely counterproductive, albeit I am dubious that the political forces existed to cut a GFA deal prior to the 1990s. And in that I believe the WP was overly optimistic in its analysis. Catullo, coming as it did on the back of Bloody Sunday, not even John Hume would have been f**king annoyed. A few years ago I had a conversation with an english guy who was in the parachute regiment years after that, he was in the territorial army rather that full-time but none the less, and a dead sound guy, working class, engineering qualification from the local polytechnic, railway engineer in his day job. A genuinely nice, compassionate and well rounded person. His recollection of the event and the aftermath in his community was one of disbelief and shock that someone would want to bomb their local barracks. Whatever about the events of Bloody Sunday, a community in England being punished for those events in no way evened any scores. John Hume had no time for republican militarism, and more importantly nor did Tomas MacGiolla. I expect you agree, but your comment seems to imply that bombing was an acceptable tactic, which doesn’t at all line up with many of your other comments posted in the past about the militarism practised by the provos. Leftonthecross, it doesn’t. I’m pointing out that setting up a hypothetical situation of whether Giolla would have shed a tear for parachute regiment officers killed in the aftermath of Bloody Sunday is a bit of a strawman as very few nationalists and even fewer Republicans would have shed a tear in the same hypothetical situation. I don’t think that means that the IRA (Offical and Provisional) was correct in killing people. If someone is going to pick holes in McGiolla’s legacy, his hypothetical lack of sympathy in a hypothetical situation is a bit of a weak point. Having said that, at least Catullo has made points about McGiolla, and critical points at that, which are persuasive and coherent, which is a welcome break from the prickless trollism which has invaded this site lately (think it’s obvious who I mean). Conor, apologies for misinterpreting your comment. if you’re a pacifist living in an ideal world its easy to criticise others. Catullo, perhaps a puerile glance at Irish history led you to some of your remarks. An in-depth study would have shaken you with the revelations of English atrocities in Ireland over the centuries. Have you no knowledge at all of the 1579-81 slaughters? The near-genocide 0f 1642-52? The killings of the 1790s? The English laissez-faire attitudes during the 1840s? Every age, every century. What a fierce dense unthinker ! Your gurnings are childish and, worse, bourgeois! Well seeing as Mother Theresa was a right piece of nasty work who revelled in increasing the suffering of others I’m not surprised that few people mourned her. The remains of Comrade Tomas Mac Giolla, former President of the Workers Party, will be brought to Ballyfermot Civic Centre, Ballyfermot Road, Dublin, tomorrow, Saturday, February 6th, at 2pm. His body will repose there from 2.00pm – 9.00pm on Saturday and from 10.00am – 5.00pm on Sunday. There will be a Tribute Ceremony at the Civic Centre in Ballyfermot at 12.30pm on Monday, February 8th. Immediately afterwards Tomas’s remains will be brought to Palmerstown Cemetery, County Dublin, for burial. As a teenager in the 80’s I began to develope my socialist politics. Two key events took place during my teenage years that heightened my awareness of my class consciousness.The miners strike in Britain had a significant impact in cementing my socialist politics.Also the emergence of the Workers Party, as a genuine Marxist party with genuine roots in working class communities, and working class struggles. I remember on Saturday morning at home as a teenager, watching the Workers Party Ard Fheis on tv and hearing Tomas Mac Giolla give his address as the leader of the WP. Everything he said in his speech made perfect sense to me, it inspired me to become a member of the Workers Party, I was so proud to have Comrade Tomas as our leader. A man who was a fighter. A humble man. A very sincere man.A man who loved his pipe too. I was so glad to have had the opportunity to see Tomas and his partner May a few months ago at a book launch. I ensured that after the book launch that evening I would seek Comrade Tomas out to greet him, shake his hand and to reassure him I was still a Marxist, and still very proud to have known him and to gently remind him, it was his speech I listened to as a teenager that inspired me to become a member of the WP. We shook hands and we smiled. Thank you Tomas. We know now who simply used the WP as a vehicle to advance their own political careers. Those very same social democrats who are issuing hypocrtial statements about Comrade Tomas as being a man of principles, when they haven’t a principle bone left in their bodies. The very same social democrats who share responsibility for ordinary working class people having to pay higher bin charges this year.Yes Comrade Tomas was a man of principle , a man that would have fought tooth and nail to oppose those charges. La lucha continua Comrade Tomas. Recently reading Barry Flynn’s book on the failed border campaign, Soldiers of Folly, I was struck by how bizarre the whole thing was: working class men heading north of the border to attack police stations while their home communities wallowed in economic depression. Sean South came from a time and city that produced Frank McCourt’s Angela’s Ashes. MacGiolla was part of the re-think that followed that Operation Harvest collapse. Whatever one’s opinion on his subsequent political trajectory he did remain steadfast to his political beliefs. An Irish American who for many years since 1969, supported the Officials and their socialist policy and worked at the National Association for Irish Justice in New York, for $25 a week for a year and a half . I know many Irish would say I should have no opinion,but people like Tomas and Sean O’Coinnaith stayed true to their principles all their lives. Never became wealthy, cared about ALL the people of Ireland. Cathal Goulding, Sean, Tomas, will rest in great peace. B’fhear ionraic é. Seans go mbeadh sé níos compordaí anois i measc laochra na nGael. Tuigim nárbh Chriostaí ach é sin luaite – Ar dheis Dé go raibh a anam uasal. I knew Tomas MacGiolla rather well. Don’t get me wrong, we were not “friends” although we were friendly. We were Comrades. He was President of Sinn Fein when I joined. He was president of the WP when I left that organisation at the time of the Hugner Strike. I did not support the Provos, or think the Hunger Strike was a good tactic, but there was no way I could in good faith follow the WP Party Line and refuse to help brave Irish men and women struggling for justice and fair treatment for all prisoners. ANyway, I digress. Tomas MacGiolla was a man of outstanding integrity and dedication. You may or may not like his particular brand of Republican Socialism but that did not matter to Tomas. No winds of public opinion or trendy social democracy thinking would sway this man. Tomas in his time was a physical force Republican. The time came when he realised that armed struggle was counter-productive. It was not that he was a pacifist. Had the situation changed in such a way that armed struggle seemed the way forward again he would have had no problem with that. To him, and all of us, armed struggle was only one tool in the Revolutionary’s tool box. I cannot say if he knew of the Aldershot bombing beforehand. If he said he did not, I believe him. He was genuinely saddened by the tragic results, but not ashamed of the attempt. Those were bad times indeed, and the OIRA can hardly be faulted for trying to strike the Para lion in it’s den. As to the killing of Seamus Costello, Tomas MacGiolla once told me in private that “we” had nothing to do with it. I have no reason to doubt him. I THINK I know who did it, and I think it was a matter of personal revenge for killings carried out by the INLA against Officials, but not an action sanctioned by the Official IRA.. As far as I know no one has ever claimed responsibility for Seamus’ death. Tomas, old comrade, rest in peace. You lived a long and useful life. IT is too bad that the “wee men” could never understand you. Had they listened our country would have been spared decades of horror and might by now by free. Proud to have known you. I remember you with affection and pride. A man of honour and principle. A man of the people. A great loss to the Workers’ Party and the working class. Granted the denial by the WP leadership that the OIRA even existed, I would take Mac Giolla’s denial that they had anything to do with Séamus Costello’s murder with a grain of salt. Good old Eoghan, always with the digs. And I should add I thought at the time and ever after that Ken Maginnis’s remark (and it’s Maginnis, not McGuinness as EH writes reiterating an Irish Times misquotation) was remarkably patronising. Garland is on RTE1 now.